Does pink make your world go ‘round? From a bubblegum-hued cow to a flamingo-colored submarine, this tabbed board book features the many shades of pink! If everything were pink, a pink cow would blow pink bubblegum, pink jewelry-wearing bumblebees would buzz around pink roses, and a pink submarine would carry pink passengers! From bubblegum to ballet, rose to petunia, this book is a celebration of color. 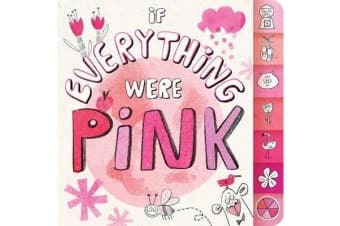 Each shade gets its very own tab on this novelty board book, and readers will love using their imagination as they explore the world of pink.